The ZHP-100 Collar Removal Pliers from Zephyr feature a diamond shaped jaw which allows the pliers to grip from any direction and may be used to remove collars in open access applications. 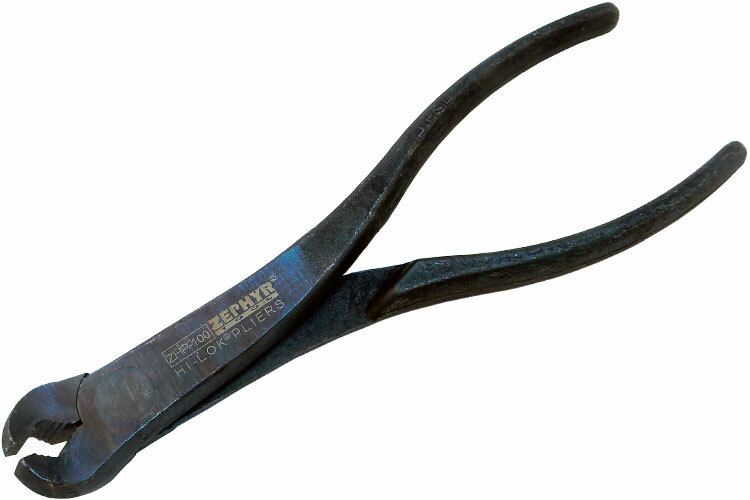 These collar removal pliers are best suited to smaller aluminum collars (-5, -6, -8). Zephyr offers 2 styles, both are best suited to small collars. It has been our experience that they do not work as well with large collars, or steel/titanium collars where greater gripping force is required to achieve the required break away torque. For those more difficult collars, we recommend the OMSK Sockets or Savi Socket® style sockets fitted to a standard hand ratchet will usually offer far superior results. These pliers have a more aggressive offset of about 60 degree. The jaw serrations are perpendicular to the collar seating surface when the handles are laid flat, but angle at 30 degrees if the flat part of the head is rested on the collar seating surface. The ZHP100 Collar Removal Pliers feature a diamond shaped jaw which allows the pliers to grip from any direction and may be used to remove collars in open access applications. The ZHP200 Collar Removal Pliers feature a diamond shaped jaw which allows the pliers to grip from any direction and may be used to remove collars in open access applications.